Those nice people at Volvo are only planning on selling 5,000 C30s in 2007. They’d better make some more. First the looks. 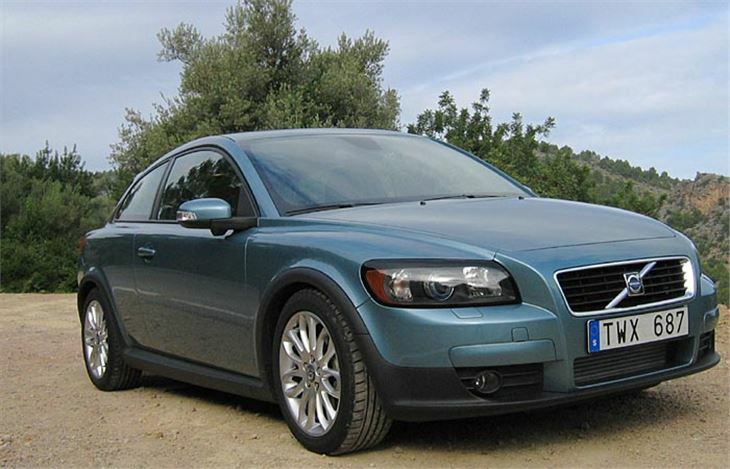 The C30 isn’t just a good looking car, it’s exquisite. A lot of people will buy it for the styling alone. With its simple glass rear hatch, it harks back to the 480ES of the 1980s, and the P1800ES before that. 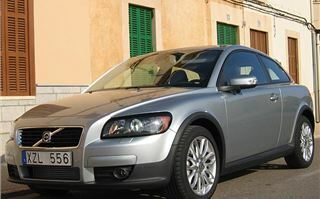 The car abounds with Volvo detailing. For example, you still get a clip in the front window frame to hold parking tickets to the screen, so you won’t get done for “failing to display” when they blow off the dash top into the footwell. It has the same ‘floating’ centre dash feeding into the console as the S40 and V50. 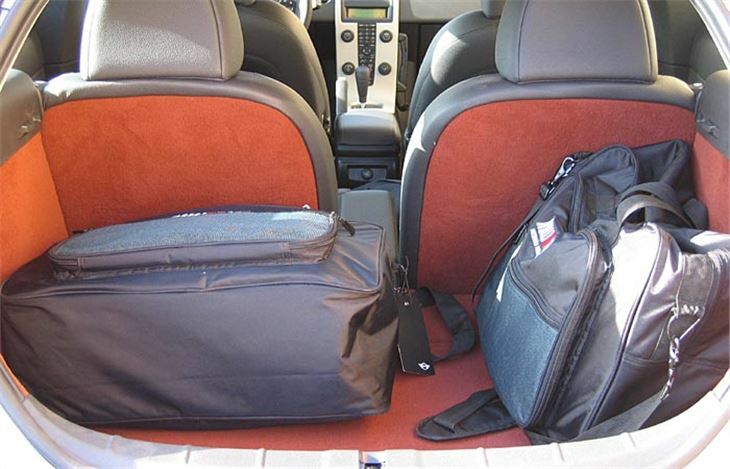 And in the C30 case has a useful cubby behind. As an optional extra you can order Volvo’s patented ‘BLIS’ blindspot eliminating system that warns you if another vehicle has crept into your over-the-shoulder blindspot. 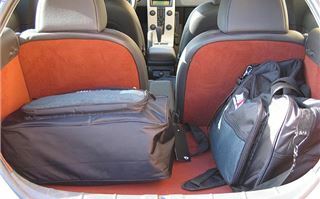 And with all the primary and secondary safety features you’d expect on a Volvo, you have a better than average chance of surviving to trade-in time. 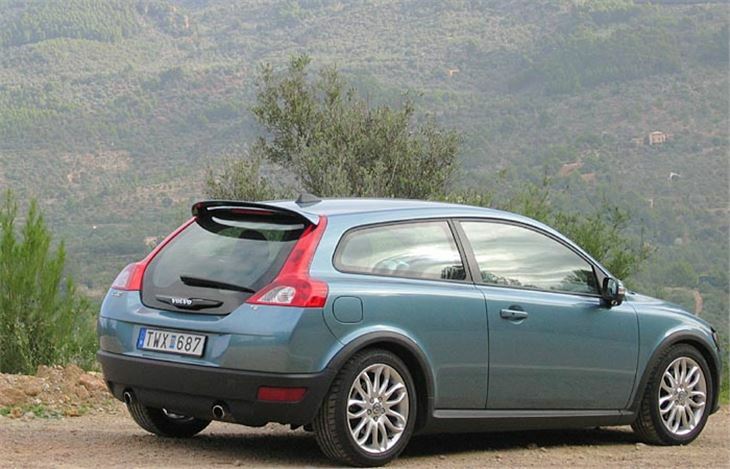 As you can see from the list of engines and prices you can have a C30 with anything from a 100PS 1.6 chain-cam petrol engine to the same fire-breathing 220PS 2.5 turbo as the Ford Focus ST.
It’s not adrift on price either. Giving you more car with more features than an A4 for less than an A4, a BMW 1 Series, or even a VW Golf. And it’s very sweet indeed to drive. Like a very slightly softer Ford Focus ST that gets on with the job without shouting about it. You sit behind an unfashionably large diameter steering wheel that’s pleasant to hold and informs you exactly what each road wheel is doing. 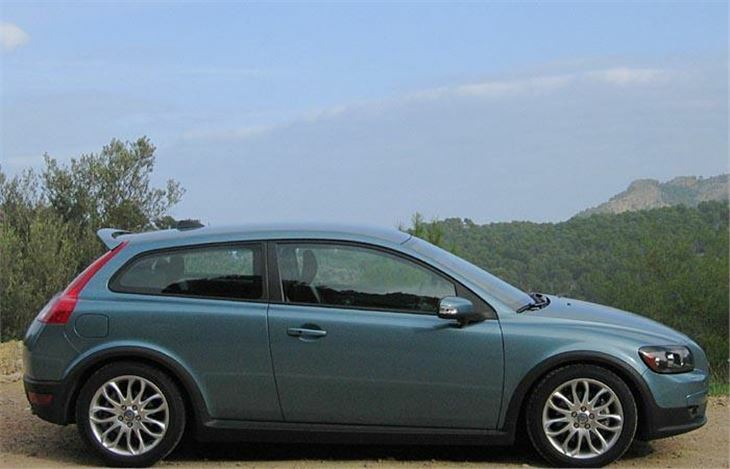 On the 17” tyres of ‘our’ C30 T5 SE it would understeer eventually. Though not soon enough to want to trade those 17s for the gripper but harder 18” tyres. The 220PS engine has bags of torque in the rev range you naturally find yourself, so you can use 3rd instead of 2nd and 3rd instead of 4tth and enjoy the beautifully fluid way it strings a series of tricky mountain road bends and hairpins together. Like the BMW 335i 6-speed manual, the gearing and the engine’s torque curve are perfectly matched. 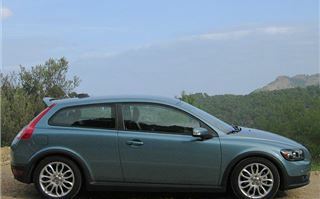 Despite developing more torque, the 180PS 2.4 litre D5 Geartronic auto was far less satisfying to drive. It’s fast enough, and will suit some drivers looking for a potential extra 9mpg (or wanting to tow something with it). But it’s far less of a driver’s car and sometimes lacked the kickdown alacrity you’d expect from 350Nm torque. 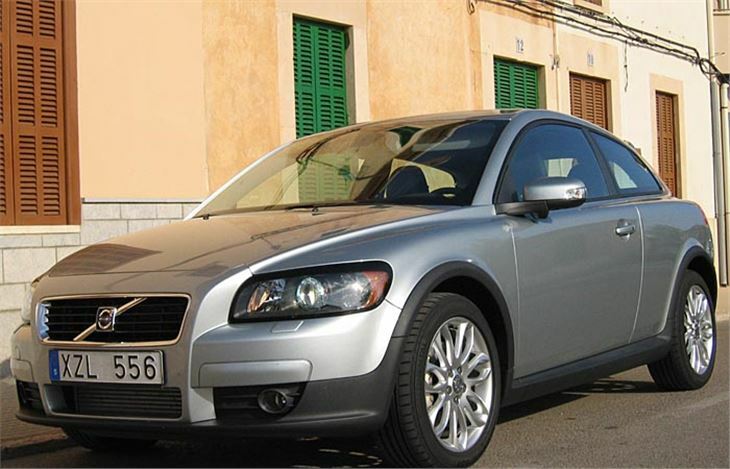 Volvo predicts that most of its sales will be 1.6 petrol, 1.6 diesel and 2.0 litre diesel. I can’t comment on that at this stage because none were available to drive on the launch. But the 1.6 diesel is a very sweet engine in other cars, notably the Ford Focus, Mazda 3, Peugeot 207 and Citroen C4. 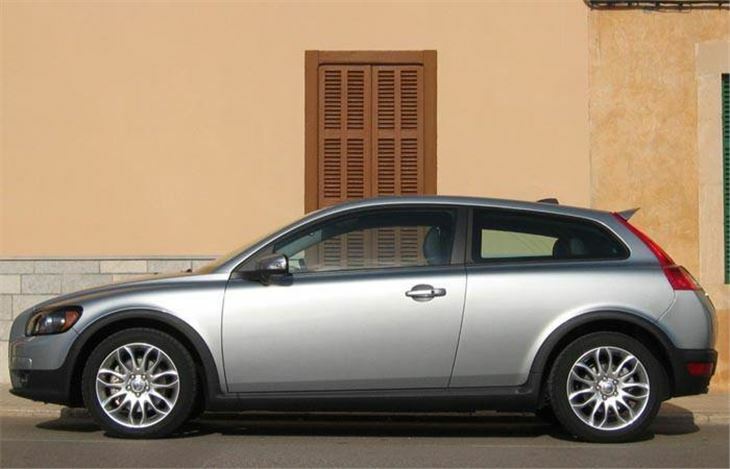 It offers diesel economy with the characteristics of an exceptionally torquey petrol engine. Though far torquier, the 2.0 diesel is much a gruffer engine with a more sudden torque delivery. The chain-cam Mazda derived 100PS 1.6 is a perfectly reasonable range-starting engine, kicking off at a sensible £14,750. 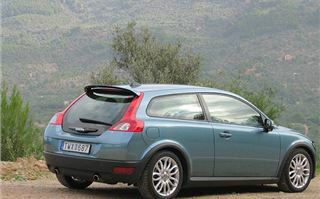 But I strongly suspect my favourite will remain the C30 T5 manual. A Focus ST in a terrific looking and far more socially acceptable suit of clothes, and a better car than the Audi A3 2.0T, VW Golf GTI 2.0T or BMW 120i. 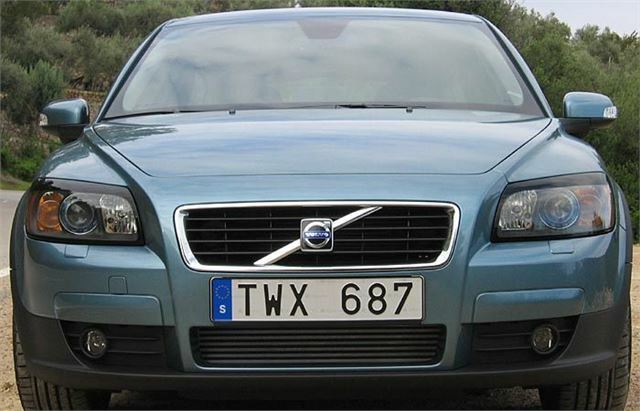 It’s the kind of car young people can choose as a fashion statement and older people can happily drive because it’s a Volvo so doesn’t make them appear to be suffering some sort of mid-life identity crisis. Volvo had better put the factory on overtime.